We need to temper that excitement a bit. Too much hype is never a good thing. Well, sort of. According to SOE Director of Online Entertainment David Georgeson; EverQuest next represents a departure from the linear continuum of MMOs, with EVE Online as the king of sandboxes and WoW as the ruler of the more standard experience. In essence, I suppose it’s what you’d get if you mashed Minecraft, Eve, and World of Warcraft together into one large, teeming mass of awesome. According to SOE – and judging from what we’ve seen so far- this could represent an evolutionary leap in the world of the MMO. Sony’s come close to striking gold with new and innovative concepts before. I’m sure you all remember Star Wars Galaxies, no? That may well have been one of the best Star Wars games ever created, until the New Game Enhancements effectively neutered the title, driving away some of its most loyal players and ultimately leading to its closure shortly thereafter. That’s not the only high-profile flop SOE’s been associated with, either. In the past, many of their releases have followed a common pattern. They start out great. People positively love playing them. Unfortunately, nothing lasts forever – for one reason or another, the title starts losing players (perhaps even because of some direct action on SOE’s part). The organization, desperate to retain its users, makes a bunch of terrible, high-profile changes that drives away what few players remained. Then they close the game’s servers down. Granted, they’ve gotten a lot better in recent years, but I’d still be cautious. Old habits die hard, after all. The people making EverQuest Next aren’t new to game design. They’ve been in the industry for decades – many of them actually worked on the original EverQuest. What’s more, Next is effectively the result of a brainstorming session between these veterans of the features they most wanted to see in an MMO – but which no game had yet been able to deliver. Essentially, the conceptualization stages for EverQuest Next was a laundry list of what this group of experienced MMO developers loved about MMORPGs. That’s not necessarily a bad thing, mind. On the surface, that means you’ll be able to play Next without having to shell out any cash for additional content. At the same time, if SOE isn’t careful, Next could very easily devolve into a game plagued by pay-walls and ‘easy win’ purchases. I’d give them the benefit of the doubt for now, but at the same time, everyone should be aware that many consider “Free to Play” a four-letter word for a reason. Most MMORPG creatures follow a very simple algorithm: they hate the player. I don’t just mean they don’t much care to be in the same room as any given player. Oh no, it runs deeper than that. They despise everything the player represents, the mere sight of a player character is enough to drive them into a maniacal, frothing rage. 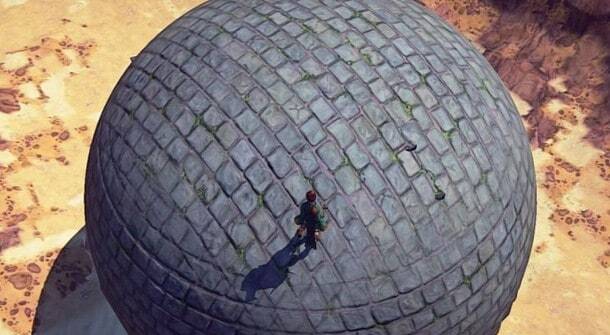 EverQuest Next is going to be different. According to the developers, the monsters are going to have their own personal motivations. They will have likes and dislikes. They’ll have personality. A tribe of Orcs, for example won’t just be attacking a city because it happens to be there – they’ll be after gold from that city. The problem with artificial intelligence is that, well…it’s still noticeably artificial. Even though the monsters are obviously going to be smarter than the average bear, we’ve got to pause and question just how far this new AI can drive gameplay. I think we’ll see the creatures in Next do some pretty cool stuff, but I somewhat doubt it’s going to be anything particularly revolutionary. SOE has gone out of its way to make the world of EverQuest Next feel like a living, breathing entity. Using a voxel engine created by Miguel Cepero of Procedural World, they’ve given players the ability to quite literally reshape their surroundings – a fireball, for example, could be used to blast a couple of Orcs to cinders, but it could just as easily be used to destroy the bridge those Orcs are using, sending them plummeting to their deaths. Of course, monsters can do the same thing players can – a dragon, for example, might fly by and decide to start leveling a player’s castle out of boredom. To further draw players into the world, quests will be dynamically generated and the admins will occasionally throw a natural disaster or invading army their way. In short, it’s supposed to feel less like they’re playing an MMO and more like they’re part of a real, believable fantasy world. The problem here is that if the features which make EverQuest Next feel ‘real’ aren’t implemented with absolute precision, people are going to get bored, and there’s only so far dynamic generation can go. That’s always a risk when you’re setting players to working out their own narrative for a game. As an example, I’d like to point to Skyrim’s Radiant Quest system, Originally, it was hailed as downright revolutionary; you could keep playing the game for as long as you pleased no matter what! We all know how that turned out. The quests were lackluster, the rewards were terrible, and the whole system was boring. Long story short: Landmark is effectively a free-build engine which will allow players to cobble together their own terrain, structures, and locations to be imported into the game proper. It’s a tool which literally allows players to re-shape the world of EverQuest Next, and it’s entirely free. Sounds pretty awesome, right? Truth is, people are dicks. SOE has already admitted that it’s limiting destruction within cities to prevent them from becoming “player parking lots,” but I can all but guarantee that in a sandbox title as large and expansive as Next, people are going to find a way to abuse the system. It’s really just a question of how.